In recent thrifting and garage sale-ing excursions I have found some things that will grace my home during the Christmas season. Before I put them away I want to share them with you. 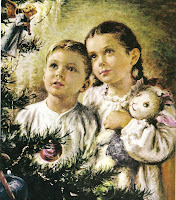 I love these little angels! Their robes are the palest blue which doesn't show in the picture. 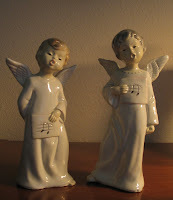 During the holidays they will join the other "singers" on my piano and add to the musical moments of the season. Aren’t their little faces sweet? 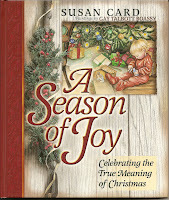 A Season of Joy: Celebrating the True Meaning of Christmas by Susan Card with paintings by Gay Talbott Boassy, Harvest House publishers, 1999. 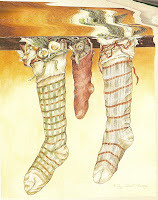 The illustrations in both books are marvelous! What terrific things you found! Just wanted to say thank you for stopping by my blog...I'll be sure and post a picture when I get the roof painted on my birdhouse. Love your thrift store finds. 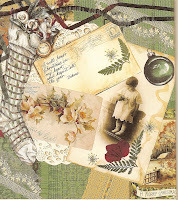 The angels are sweet and the pictures are really nice in your books.